We are available for tours and tastings by appointment from the hours of 9 AM to 6 PM. Leaf and Vine is a Father and Son led winery specializing in single vineyard, single varietal wines. All of the wines we produce are made with indigenous yeast, and bottled unfiltered, unfined. We offer an educational tasting that can be catered to all ages, even our younger guests not yet able to enjoy our wines will have a good time. We conduct our tasting within our barrel room; most tastings are conducted by our winemaker... His ability to be both educational and casual truly are what makes our tasting experience stand apart. Music in Tasting Room: Really good music that you'll be super pumped to listen to while you taste our wines. View from Tasting Room: In the heart of our winery. Wine Education: Tasting conducted by the winemaker, it will be as educational as it gets, but also user friendly. 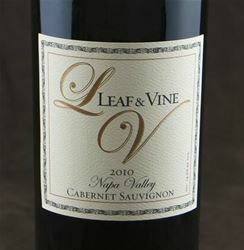 To join the wine club, visit www.leafandvine.com or call 707-478-1725. New wine releases that are shipped to you before they are presented to the general public. Four direct shipments of 4-bottles per shipment for under $100 per shipment. Each year you’ll receive our Harvest T-Shirt, commemorating that vintage. Direct Access to winemaker Timothy Keith, your own personal concierge to the wine industry. 10% off all purchases for Napa residents and guests of Napa Residents. Leaf And Vine is certified under the Napa Green Winery Program by the Napa County Department of Environmental Management (DEM) and the Association of Bay Area Government’s (ABAG) Green Business Program and completed all the regulatory components needed for environmental sustainability. These components included developing water and energy conservation methods, preventing pollution, and reducing solid waste. In addition to developing sustainable winery practices, this program is set to become the standard for the state of California. Leaf And Vine is certified under the Napa Green Certified Land Program. Leaf And Vine has created and implemented a customized farm plan with measured results that addressed all aspects of its property, vineyard land as well as non-farmed land, including practicing soil conservation, water conservation, stable drainage, riparian corridor enhancement, fisheries and wildlife habitat enhancement and long-term improvement and sustainability.